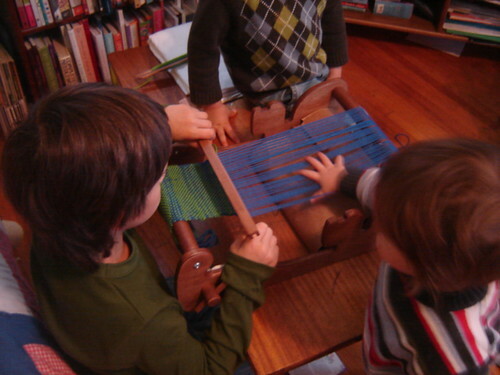 For some reason I never blogged about it, but somehow a Cricket loom magically appeared for my birthday last spring. Weaving is the one fiber art that Little Man has had some real interest in, so the first project has been his and my collaboration. This was actually fun for about five minutes. Then Knittykid began to start stealing my yarn and Spinner started taking my spinning wheel apart. I then realized than any hope of getting something done with all three of them in there was pretty much a dream and I jumped ship. But hey, five minutes was fun! Gotta take your bliss in bits and pieces sometimes…. I’ve enjoyed reading your book reviews for the contest. You’ve got just five days left , November 1st us the deadline. Hope you are enjoying reading the reviews so far. There is a lot of great stuff in the comments and I know I’ve been made aware of some books that I might not have though of. Be sure to check out Ellen’s review of 2-at-a-Time Socks: Revealed Inside. . . The Secret of Knitting Two at Once on One Circular Needle Works for any Sock Pattern! And let me know when you’ve got a review up on your blog so we can read them all. I’ll link them up here. Remember, short and sweet is great! In the meantime, I’ve got a few books I’ll be picking up at the library tomorrow to share with you this week. At some point, it all shifts you know, there will be time again.